Joboshare iPhone Call List Transfer is an amazing handy iPhone Call List transfer tool which can fast transfer iPhone Call List to Computer to avoid the already existed Call List being deleted. 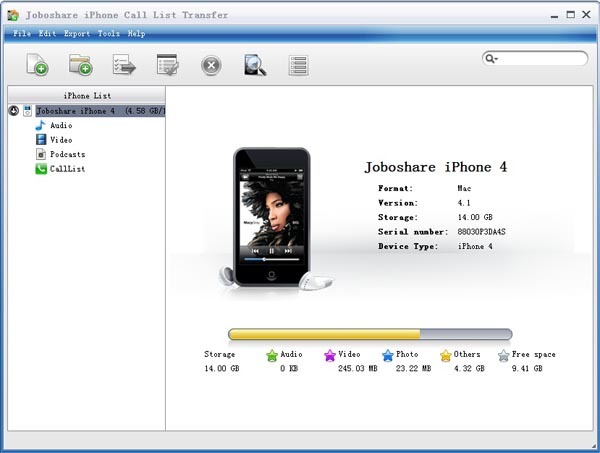 Moreover, Joboshare iPhone Call List Transfer can also transfer music, video, Podcast, TV Show from all types of iPhone/iPod/iPad to Computer, such as iPhone 3G, iPhone 3GS, iPhone 4, iPod classic, iPod shuffle, iPod nano, iPod touch, iPad, etc. With Joboshare iPhone Call List Transfer, you can transfer music, video, Podcast, TV Show files from Computer to iPhone for viewing and playing. Besides music, video synchronization, you can even treat your iPhone, iPad or iPod touch as a portable hard disk after Joboshare iPhone Call List Transfer is installed. Free download Joboshare iPhone Call List Transfer to transfer iPhone Call List to Computer for backup! 4.Transfer all the iPhone Call List or the specific iPhone Call List to computer as .txt files. Qweas is providing links to Joboshare iPhone Call List Transfer 3.2.1.1219 as a courtesy, and makes no representations regarding Joboshare iPhone Call List Transfer or any other applications or any information related thereto. Any questions, complaints or claims regarding this application Joboshare iPhone Call List Transfer 3.2.1.1219 must be directed to the appropriate software vendor. You may click the publisher link of Joboshare iPhone Call List Transfer on the top of this page to get more details about the vendor.